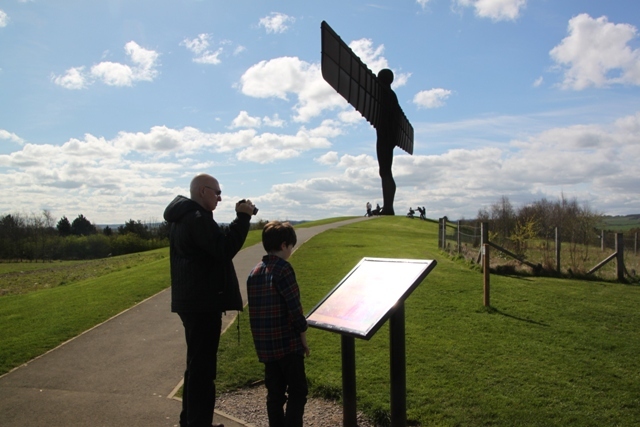 Last thing to check off our Northumberland list was the Angel of the North. Having seen it from the road below Son was super keen to get a better look and get up close and personal with the Tyneside giant. 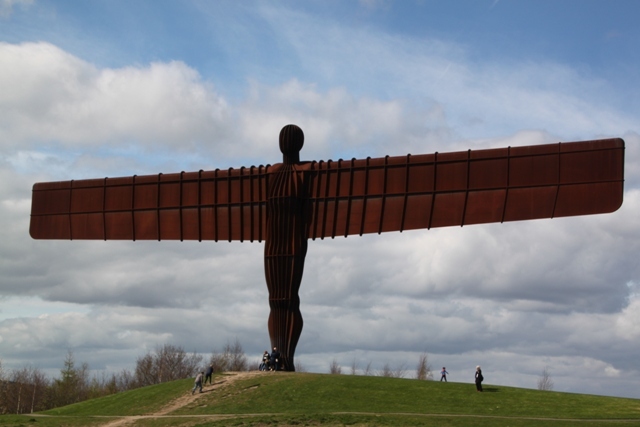 Easy to get to and easy to spot – this is England’s largest (I think) sculpture. Controversial when it arrived it is certainly well-known. We parked up at the surprisingly busy car park, armed ourselves with ice creams and set off to explore. You can walk around the sculpture, see it from all angles and appreciate how massive it is when you stand dwarfed next to it. Created by Anthony Gormley in 1988 the Angel is made from steel and stands 64 feet tall or as Son preferred 4 double deckers high. Not looking particularly angel like, it has outstretched arms and is the width of a 747 plane. The statue is on the site of a former colliery and has to withstand winds of 100 miles per hour. It won’t be around forever, they expect it to last around 100 years. This was one of Son’s trip highlights – he had been fascinated by the statue before we came and was not in the least disappointed. This was the first time I’d seen it up close as well, I’m glad we made the little detour. 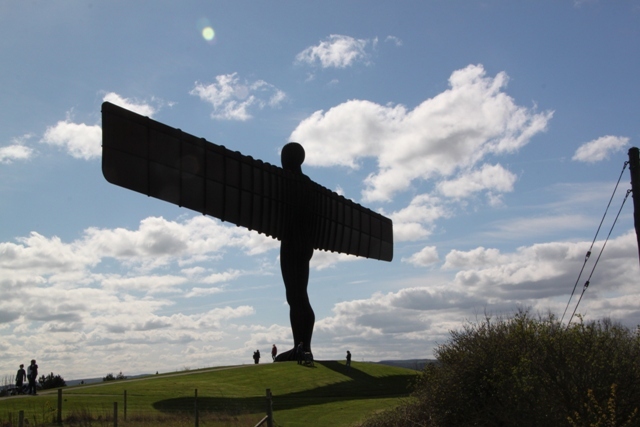 We admired the angel from near and far before taking our leave of the “Gateshead Flasher”. How interesting! I love when there are pieces of art in strange places! Me too! This one is completely strange but weirdly fascinating! I’ve always really liked the Angel of the North and never really understood why it was so divisive. It’s very striking. I agree – we all loved it and found the Angel and its location/history really fascinating. Last weekend I crossed Northumbarland but sadly could not stop over as there was a long drive ahead. Your posts makes me wanna this place more. We drove through the county many times in the past but never really stopped as like you, we always seemed to have a long journey still to come. However it made me realise how much there was to see and do and what a beautiful county Northumberland is. If you get the chance to stop and explore sometime, I’d definitely recommend it! Definitely going to my list. That is so beautiful. What are the wings made of? Why was it controversial. It looks just massive. The whole thing is made of steel – amazing isn’t it! The opponents claimed it would distract drivers and cause accidents and also that it would ruin the views. It’s become a big tourist attraction though so I guess they were wrong. I love it! Fascinating. It reminds me if Icarus rather than an angel. Yes hadn’t thought of that but it definitely does – Icarus or a cyborg! Quite an apt name too we thought!! We were told the nickname on a tour – quite a good one I thought! It’s a lovely spot.